Xining (西宁; Xīníng; Tibetan: Sulang) is the capital of Qinghai Province and the capital of Xining City District, a prefecture of Qinghai. The large city of Xining acts as one of the major gateways to the Tibetan Plateau. It is an ancient highland city on the Yellow River which offers many scenic spots and historical sites. Although the city itself has a strong Islamic flavor, as it is home to many Hui people, you will start getting a more Tibetan feel as you move away from the city. Xining Airport (IATA: XNN), located 15km south, southeast of the city, has flights to Beijing, Chengdu, Chongqing, Golmud, Guangzhou, Lhasa, Shanghai, Shenyang, Urumqi, and Xian. Shenzhen Airlines fly into Xining from Hong Kong. The airport bus makes a run from somewhere in town 2 hours before the flight departs and heads back to the city centre whenever a flight lands. The bus stand is directly in front of the exit door. The 30min ride to/from the airport ¥21. For taxi, it costs ¥100 to/from the airport. High-speed rail services from Xining to Lanzhou, northern Gansu, and Xinjiang opened December 2014. These trains are much faster than normal trains, but are also more expensive. LongDistance Bus Station is on Jianguo Road, on the other side of the river in view of the train station. There are also buses for Golmud, Lhasa and Yinchuan at the western end of the square in front of the train station. There are plenty of buses that get you around town. The most useful is bus #1 that runs through the centre of town along Dajie to the train/bus station. All fares are ¥1 regardless of distance. Please note that most of the bus services end around 9pm, and maybe even earlier during the winter season. There is a medium-distance bus station located on the North-West corner of KangLe intersection on the east side of the city. From here you can get buses to smaller areas such as DaTong (¥6) and HuZhu (¥12) and HuZhe BeiShan forest Park. Taxis run on the meter (¥8 flagfall) but some drivers are open to negotiation, especially late at night. Dongguan Mosque (东关清真大寺; Dōngguān Qīngzhēndàsì), Dongguan Street (东关大街; Dōngguāndàjiē) (Bus 1, 2, 23). edit The main mosque in Xining. A spectacular site when ten of thousands of Muslims gather for prayer during the morning of Hari Raya Puasa. Handmade Tibetan Handicrafts and jewelry made by Tibetans can be bought at the AmdoCafe (see Eat section under Cafes). There is a very interesting Tibetan Market close to the Eastern Railway Station and opposite the long distance Bus Station. Xining's main minority groups provide a large portion of the food on offer. The Hui, a broad term for Chinese Muslims, serve up spicy noodles, lamb kababs and flatbread (bing). Tibetan food choices are concentrated around the train station, mostly small places that serve momos and noodles and seat guests on small coaches. There is a restaurant area right next to the Shuijing Xiang Bazaar, in the center of the city, and throughout the evening and into the night there are many street stalls serving good food around Ximen and on the western side of Jianguo Road. Western food options are slim, but you can get various options if you know where to look. The two best areas are on XiaDu DaJie, near GuoJiCun XiaoQu (International Village Complex) and in the WangFuJing Plaza, off WuSi DaJie. The city is littered with small coffee shops, especially around the newer apartment complexes that are being developed. See below for some of the better ones. A number of bars are located at the end of the city's main snack street. These tiny places each have only a dozen tables, and all offer extensive drink specials. Beer starts at ¥6 for a Tsingtao, but expensive imported liquor is also available. There is usually no cover charge. There are dozens of small guesthouses near the train and long distance bus station. Look for the characters "招待所," which in this part of town are on every other building. Most places seem aimable to taking foreigners, and prices range from ¥10 in a grimy four-room bunk (expect the other occupants to smoke in the room all night long) to ¥100 for a deluxe double. More guesthouses can be found around the town's West Gate, or Ximen. Be aware that pickpockets operate outside the train station near the buses where the police do not go. 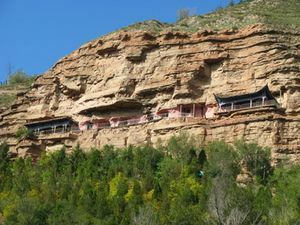 Ta'er Si (Kunbum) Monastery (塔爾寺) - one of the most important Tibetan Buddhist sites in China, in the village of Huangzhong. Qinghaihu National Park (青海湖 - also called Lake Koko Nor) - this 5,694 km lake is the largest lake in China. Buses leave all day from Bayi Passenger Transport Station ( 八一客运站). Ticket price is RMB 35 and RMB 45 for the return bus ride. The trip takes about 1,5 hour. Guide (贵德） - Take a bus to this charming, predominantly tibetan village, beyond the southern mountains. Trips from Xining travel agencies offer apparently cheap 60 yuan day trips to Qinghaihu National Park. This price does not include entry to 丹噶尔 old town (50 yuan), 赞普林卡 (40 yuan), 日月山（40 yuan) or the wharf at Qinghaihu (100 yuan) [the 'park' itself]. The last of these seems the most overpriced for what it is - but you are expected to pay. There may be a couple of forced shopping stops, including a minimum 30-minute wait at a jade/crystal sales outlet. This page was last edited on 26 November 2018, at 03:41.